Happy Mother's Day by the way! This May the biggest theme in the website is motherhood and all the layers that it entails. 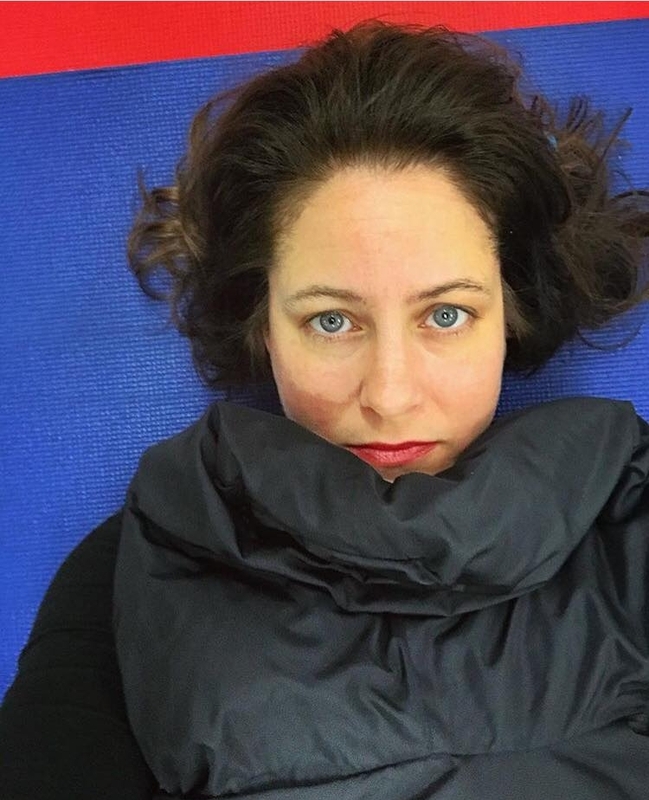 I began noticing Katy's poems on Instagram, which she has been using as a medium that limits significantly the typical presentation that poetry has had for a while. It's broken up, because Instagram gives you only so much space. But the result of her creative workaround to this limitation turns out to be refreshing, funny, an interesting rhythm, and sometimes eye candy. Katy got in touch via social media because we both frequented a very popular blog through the years. This is the beauty of social media. It brings the geographical barriers down so people of the similar mindset and values can find each other. After a couple messages we set up a FaceTime appointment to interview Katy, because she is from Syracuse, New York. She was gracious enough to answer very intimate pressing questions from someone she has never met in person, but has crossed paths online here and there. Make sure to click the pictures. They're hyperlinked! I started noticing your poems on Instagram and first I thought you were quoting an established poet. But the crediting was nowhere and I started to think that maybe it was you who wrote those poems. I was hooked! Your poems are polished, short, they pack a big punch, and they are full of emotion but replete of negative space. Like a more fleshed out Haiku. The poems started to appear on Instagram recently. What was happening before that? Yes those are my poems. I used to write and then I got married and had children and for about a decade I didn't write poetry at all. Then one day I had a Kundalini awakening experience. And you have to realize, I am not a fancy yoga person. I teach at the YMCA to people who have to do yoga sitting down. So my teaching is mostly breathing. There is no fancy or impressive yoga going on. But I had a Kundalini awakening experience and it was very strange. I could see people's energies outside of them and in different colors. I could see what they cared for because I could see their energy in front of them reaching for what they wanted. And I had a different level of empathetic experiences - I am an empath - and it was like I was feeling people's emotions as if they were mine. I could step inside of them. After that, the poems came pouring out. I simply couldn't not write them. I was at the doctor's office, or in line a the grocery store, and I had to write them. I couldn't stop them. Like labor or a train barreling down. What drew me to your poems is how polished they are, and of course the format, the color blocking, the use of the platform's limitations as a way to create rhythm and tone. They are very poignant and an observation of the human experience; especially women. But there is no victimhood, there is no self-pity. Your poems sound of strength, anger, big emotions but tempered behavior. It sounds like you are in charge at all times. And at the realization that the situation is less than ideal, in your poems you take the setting, the limitations, and use them to your advantage. Like in Girl Talk. Instead of going into a diatribe of how women are invisible and unappreciated, how gender roles decimate the expression of full personhood, you use that invisibility to your advantage to continue planning the revolution with your girl friends. Katy's poem GIRL TALK is fierce. I like that. I don't live life by "shoulds," but I think "this is how it is. What can we do with what we have to move toward better and the ideal?" Your poems seem very prophetic. You're imparting a deep wisdom. Is that your aim when you share them in social media? What do you think about when you are putting your art out there for everyone to consume? Like I said before, I had that awakening experience and then the poems had to come out. I didn't have time to think. I was scribbling at the waiting room, the grocery store, anywhere. My life is very busy so I don't have time to think about what will happen after I share the words. I just know they have to come out and go into the world. I lost my job as a teacher a few years back and I decided to open up a school in my home so I could unschool my children. It allowed me to provide for my family while raising my children and following the philosophy that is best for us. How do we know about each other? Do you remember how we crossed paths? I have read Penelope Trunk's blog on and off for years and I never commented but I saw your comments and I liked you. So I found you on social media. I love the idea of people coming together despite geographical barriers thanks to the internet. We have similar philosophy and goals to raise and educate our children. How did this pouring out of poems influence your closest relationships? With my children, I feel like the relationship is coming from a heart connection. It is not about me and my worth as a parent. Their behavior is in response to how they are feeling. And I am able to connect with them in that manner. With my husband of over 20 years...sometimes I write a poem and he says "Is that about me?" and I say "No, it's not. It's just a thought I had." But then as the days go by and I meditate on the words of the poem I realize that yes! it was about our relationship. And it's almost like the poem knew before I consciously knew. The poem is pointing to something that wasn't obvious to me. I've heard people talk about their art as something that has a life of its own and they are just channeling. I think your poems are powerful because they are coming from a place you can't help. You are just channeling. For Mother's Day 2018 I hope Katy's poems find some of you in the right place. Some of us still struggle with the merging of all our identities. Motherhood and womanhood are continuously coalescing and evolving as we grow. There is no mentoring the way many other cultures have. In a lot of America womanhood and motherhood are reduced to a Proverbs 31 mention once a year. I find myself in Katy's poems. I find myself more comfortable in the struggle of opposites. And I find myself more comfortably incorporating all aspects of what being a woman can be: sexual beings, nurturing and mothering energy, captains of revolution, virtuous, angry, apathetic, scheming, vulnerable, soft, sharp, surrendered and dominant. There is a special kind of power in being a woman. And as I discover it day by day I fall more in love with the privilege given to me in this life to be a woman, and I fall in love with myself. Here are some of the poems she has given us permission to share. We will be featuring more in the future here in Denizen. But I highly recommend you find Katy on Instagram @katyabigailbarrett for a better experience of her art. Katy's poem HOOP EARRINGS deals with the nurturing energy that women exude and how it is sought after, not just by babes, but adults in need of nurturing too.